The second largest lake in New Mexico, Navajo offers multiple marinas, campgrounds and boat docks. 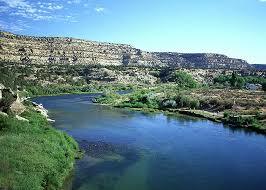 Navajo offers excellent year round fishing and, is sure to become one of your favorite spots. A Directions from Albuquerque: Take I-25 North to NM 550 (Bernalillo exit). Continue Northwest on NM 550 to Bloomfield, then go 9 miles East on US 64 to Blanco. Turn North on NM 511 and follow signs to Navajo Dam. Smallmouth and largemouth fishing is slow using jigs and crank baits. Northern pike fishing is also slow using spinner baits, spoons and crank baits.